If you can’t save a deposit right now here are some things you can do to move towards your goal of buying a property and achieving financial freedom. Hey guys! Ryan here from onproperty.com.au. This is section number 1 – the Deposit Dilemma and this is Lesson number 2 – 10 Things You Can Do If You Cannot Save A Deposit. Now, not all of us will be in a position to save a deposit right at this very point in time. There may be certain things holding us back like we do not earn enough money or we need to take care of our parents and pay for their care. There can be a myriad of things holding you back from saving your deposit right now. However, even if you cannot save your deposit right this very second there are some things that you can do to move yourself towards your eventual dream of owning a property and beginning your property portfolio. So let us talk about some of the things that you can do if you cannot save a deposit right now. I am going to tell you from the outset that as a go-through these things are not for everyone. As I say with every single lesson, go through this and if there is something that stands out to you that you can apply, great. Not everything is going to apply to you but I am hoping that 1 thing in this list will and you can go out and take action on that. The first thing is to change jobs. Often we get stuck in a job earning a certain amount of money and when it comes to getting pay rises, generally all we get is in line with inflation, 2%, 3% maybe 4% rise in our income. We often get stuck and our expenses are actually going up faster than our income is going up. And what we have found – what a lot of people have found, is that by changing jobs, by moving to another company, you can really hit the reset button and you can get a higher pay grade. Obviously it depends on what sort of job you are in, what sort of experience that you have, what the job market is like where you are and that sort of stuff. But moving jobs can be a great way to increase your income. So if what is holding you back is that you do not have enough money to put aside, changing your job could help to increase your income and help move you towards that. Or maybe changing jobs is so you are not doing an hour commute every single day so you have more time to do a side business, more time to spend less money so you are not spending heaps of money on the commute. Change of jobs can be a good thing to do. I changed jobs, I went from earning $28,000 a year, a change into a new company and they have an internal promotion and I think it was within 12 months I was earning 3 times what I was earning in my old job. So just getting into a new job and getting in a new growth trajectory can really affect your income and it did in my life going from $28,000 to earning over $100,000 per year. Something to consider definitely. The second thing that you could do is begin investing in yourself. I think it was Warren Buffet who is considered the world’s greatest investor. He said the best investment that you can make is in yourself. That means investing in yourself in education – like this course that you are doing, and a whole bunch of other things as well. It can mean investing in yourself in terms of property and learning about property. It can mean investing in yourself in terms of skill set, building your skill set that might apply to your work and your career, that might apply to building your side business, that might apply to just having a happier life and enjoying more time with your friends and family. But invest in yourself. Invest in your education. Invest in your knowledge because the more you learn the higher your potential to earn. I say this a I lot, the more you know the better chances you have of earning a lot of money with very little money to start with. If you do not know a lot then you are going to need a big chunk of money to get not even that great a return on investment. So if you know a lot about finance, if you know a lot about investment strategies then you can really improve your return on investment and you can really achieve financial success earlier. So invest in yourself. Consider buying a property book. Go to onproperty.com.au/ebooks to check out the eBooks that I wrote. Go to onproperty.com.au/books to check out the books that other people have written. You can read those about property or you can get some self-development sort of stuff, whatever it is that suits you. Invest in yourself. If you cannot save a deposit right now, that does not mean that you cannot prove yourself as a person. It does not mean you cannot improve your financial knowledge, your investing knowledge, and your life knowledge. And as you build up these skills sets it can impact your income and your ability to save a deposit in the future. Like me for example, I started as I said, a $28,000 job. It was pretty menial labor. I built up skills in procurement and on the sides I built up skills in terms of internet marketing, building websites and that sort of stuff which eventually I was able to leave that 6 figure job that I have moved into in order to go into business for myself because I have invested in myself and build up all these skills on the side. Now I am able to run my own business from home, spend a lot more time with my family and my friends which I am very grateful for. So invest in yourself, if you take anything away from these 10 tips, number 2 – invest in yourself would probably be the best one to do. Number 3, the third thing that you could do is start a side business. Maybe you do not want to change jobs. Maybe you do not feel that that is possible right now. But it could be that you could start a side business. A side business could be anything from starting websites and running them like I do. It could be creating things to sell at market stalls or to sell on Etsy or to sell on eBay or Gumtree. Or it could be a consulting business or it could be a lawn-mowing business. We will talk in more detail about some side business ideas and ways to generate extra income on the side. But a side business is a great way to grow your income without a whole lot of risks. You still have your job that you are at, that you are working at to earn your money but in your spare time, rather than spending hours and hours watching tv or watching YouTube, you can actually spend some of that time to build a side business to generate more income for yourself. Eventually you make it to the point where your side business earns more than your job and you can shift across. Or it may just be a supplementary income that you can use to save your deposit. Your job could pay for your lifestyle and then you could use your side business to begin saving for your deposit and help you buy a property. So number 3 – start a side business is a great idea if you are not earning enough money. If you do not feel you can save a deposit right now or begin building a side business, begin building that income up. As well, that side business could eventually become an asset that you sell. For example, I run websites and a website that generates passive income sells about 20 times the monthly profit. So if I have a website that makes a $100 a month in passive income then I could potentially flip that and sell it for about $2,000. And so yes I am getting this income of $100 a month but I then have this asset worth $2,000 which I could then sell. If you build up a side business, it does not have to be an internet marketing or websites. But if you build up a side business that could potentially be an asset that you could sell and that could form a large percentage of your deposit. So you can generate income to help you save but then you could sell it for that lump sum to save your deposit as well. Fourth thing that you can do if you cannot save a deposit is begin investing in the stock market. Obviously saving for a deposit you are going to need a large chunk of money to buy a property however you can get into the stock market for a lot less. Generally, I think around $1,000 is probably one of the lowest figures that people start with. Maybe $500 can get you into the stock market. But you could begin investing in the stock market and getting a return on the savings that you do have and hopefully a greater return than what you are getting just by putting your money in the bank. I have my deposit saved in the bank earning 3%, 4% maybe. Not a great deal of money. Really I should be focusing on investing in the stock market, getting a better return for my money so that when it does come time for me to buy my property I have a bigger deposit because I have that income coming in from my investments in the stock market. For me, it is not something that I am going to do because as I have discussed in previous videos on On Property, the stock market just seems to go over my head and I just do not really understand it enough to feel confident investing in such a way that I do not think I am going to lose my money. For me it would just be gambling so I may as well just put my money in the pokies and spin the wheel because I do not understand the stock market. But if that is something you are interested in, that you can learn about, maybe you want to invest in the stock market or invest in some other sort of asset class in order to grow your income. Maybe you want to invest in gold or you want to invest in silver or you want to invest in someone’s business. There are a lot of different ways that you can invest your money as you are saving your deposit for property or if you have a little chunk of money and you cannot save anymore you could put it in something that is going to earn you a higher income more than it will grow over time, getting you closer towards saving your deposit. Number 5 is to ask for a raise. I asked for a raise in my job where I was earning $28,000 a year and I was successful. I got a raise. But it was a pretty mediocre raise. I am not the best person to talk about how to get a raise. I increased my income as I said by shifting jobs and getting an internal promotion which significantly increased my income. But I have heard successful people present options to their boss in order to secure a raise. The best person that I have seen teach about this is a guy called Ramit Sethi. He is at iwouldteachyoutoberich.com. He teaches people how to get raises all the time. He has particular strategies to use in order to get a raise. So approach a boss, ask for a raise, see if you can earn more money for doing what you are doing in your job or maybe taking on some more responsibilities. So rather than shifting roles, you can get a raise and you can earn more money. Number 6 is to focus on your career. By this I mean focus on advancing your career. Again it comes down to investing in yourself, improving your skills set and then taking on more responsibility so that hopefully your career can advance either within the company that you are in or you could potentially switch jobs and advance your career that way. Get a goal in mind of where you want your career to progress to and then work out what you need to do in order to get yourself to that level so that you are earning more money and so that you are in a better position to save a deposit. So if you cannot save a deposit right now, you are in a career that you enjoy, you are in a job that you like, focus on what can I do to advance your career to move up in the chain so I can earn more money. Number 7 is to choose a more achievable goal. Maybe you cannot save a deposit because your goal is just too big. You are trying to buy a property in Sydney, it is worth over $1 million and you are trying to save a 20% deposit. That is over $200,000 in deposit my friends and for a lot of us that is just not going to be an achievable task. $200,000? Savings? Just by saving it? Putting it away? Are you kidding me? Crazy. However, if you lower your goal and you say, Yes, I want to live in Sydney. Yes, eventually I want to buy a house. Do not give up on your dreams, okay? But if you say, Well, I can actually invest in property and begin growing my portfolio which will eventually lead to me buying a house in Sydney. You could look outside of Sydney at houses worth $300,000 and try and save only a 5% deposit. And then you are looking at $15,000 in savings plus your closing cost. $15,000 compared to $200,000, you can see the massive difference there. Maybe you cannot save your deposit because your goal is too high. How can you lower your goal so that you can begin to save your deposit? And we will talk more about that in an upcoming lesson. We will talk about how to lower your deposit and make something that is more achievable for you. Number 8, things that you can do if you cannot save a deposit is begin learning about investing. So this is very similar to investing in yourself, in your knowledge but more specifically learn about the different types of investing. Learn everything you can about investing in property. Learn about the different property investing strategies. There are so many out there: positive cash flow, renovations, subdivisions, developments, negative gearing, owner finance. There are so many different ways that you can invest in property. And if you can learn about those ways and you can find a strategy that will work for you then maybe you will be able to get into the market sooner with less of a deposit. So begin learning about investing. Begin learning about money and how money works because the more you know about money the better investor you are going to be. I recommend if you do not know a whole lot about money and finance and investing, definitely check out Robert Kiyosaki’s book The Cash Flow Quadrant. You can check that out on onproperty.com.au/cashflowquadrant. That is an epic book to read because it just really teaches you about how to shift from trading hours for dollars into a situation where you are earning passive income. And he has another book, Rich Dad’s Guide To Investing, which is the third book in his series. And that teaches you a lot about investing and that is a really good book as well. So learn about investing. Learn about how you can become a better investor and then use that knowledge to get into the property market or maybe invest in the stock market and begin getting a better return on investment so that you can save towards that deposit. Number 9. The ninth thing that you can do if you cannot save your deposit is consider partnering up or doing a joint venture. Someone that I work very closely with is a buyer’s agent. His name is Ben Everingham. He is at pumpedonproperty.com. If you need a buyer’s agent check him out. Let him know that I sent you. Anyway, he kind of reached the limit of how much he could borrow. He went into business for himself, a lot like I did and could not really borrow money at this point in time. However he partnered up with a builder that he knew and the builder put up the finance for the deal – I think the builder put up the deposit for the deal, but Ben just gathered the deal. They were going to subdivide the property and they were going to build another property in the back. And so Ben offered up his services and his skills in exchange for this partner to basically passively invest while Ben does a lot of the backend work. So for this guy it was a great deal because he could invest and get a great return on investment. And for Ben it was a great deal because he did not have to save a deposit in order to invest in his property. Now Ben knows a lot. He is already financially free in property. He did not need to do this but it was an opportunity for him to move forward in his property career and he did that without saving for a deposit. So if you cannot save a deposit consider a joint venture, consider partnering up so that you can actually purchase a property. And the tenth thing is to change your spending habits. Focus on learning to budget. Focus on learning how to curb your spending and curb that emotional aspect of yourself where you go ahead and binge-spend when you know you really should not. So if you cannot save your deposit then focus on yourself. Focus on how you can improve your habits and your spending habits so that you are a better budgeter, you are a better spender. You are spending less than you earn so that you can move towards saving your deposit. 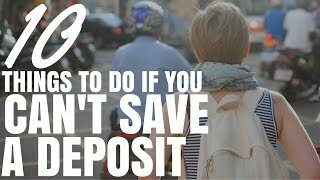 There you have 10 things to do if you cannot save a deposit right now. Hopefully by going through and doing one of these things will get you into a position where you can begin saving a deposit. That is where I want to get you through. Again going through those 10 things; number 1 was change jobs. Number 2 was invest in yourself. Number 3 was start a side business. Number 4 was invest in the stock market. Number 5 was to ask for a raise. Number 6 was to focus on your career and advancing your career. Number 7 was to choose more achievable goals. Number 8 was to learn about investing, to get really knowledgeable about investing. Number 9 was to partner up or do joint ventures. And number 10 was to focus on changing your spending habits, becoming a better budgeter. So is there something in there that you can do if you cannot save your deposit right now? Or even if you can save your deposit, is there something in there that is going to help move you towards saving your deposit faster? Hope that this has been helpful. Until next lesson. Stay positive.